Pictish sculpture, for many people, means sculpture displaying uniquely Pictish symbols. 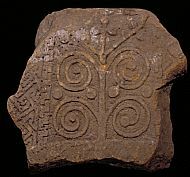 As yet, no example of the earlier type of Pictish monument – the boulder-stones incised with Pictish symbols – has been found at Rosemarkie. 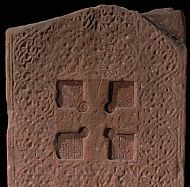 However, the collection has one of the finest examples of the later type – shaped and dressed slabs carved in relief with crosses, the Pictish symbols, and all the ornamental patterns found decorating works of art elsewhere in the British Isles, in the period from the seventh to the ninth century. We do not know the meaning of the symbols, but obviously, they were making a public statement in a context that could include the Christian cross. Not all Pictish sculpture displays the symbols, for sculpture functioned in other ways. The greater part of the Groam House Collection has no symbols, but it is as ‘Pictish’ as its great symbol bearing cross-slab. 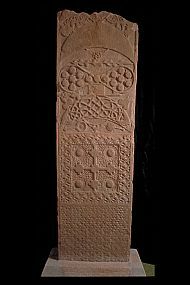 The symbol-bearing cross-slab at Rosemarkie is in many respects typical for its date, which on the basis of the nature of its decoration, can be placed towards the end of the eighth century. Like other slabs of this period its symbols are large, extending over its entire breadth. Three are decorated with all-over patterns, quite different from the simple, concentric circles and mushroom-shapes of the symbols on the earlier incised monuments. The height of the slab and the decorative panels on the narrow edges are also common at this time. On the other hand, there are unique aspects of the slab which give it a special place in Pictish art history. The treatment of the front of the cross is very unusual. Most of its surface is covered with amazingly fine ornament, regular interlace on the upper half and arrangements of animal ornament on the lower. In the midst of this flat, understated complexity is set a panel containing an equal-armed cross. It is placed within the upper half of the slab, and although it occupies a comparatively small area, the viewer is compelled to look at it. There is nothing like this elsewhere in Pictish art. When the slab was complete the upper half of the back of the slab displayed three crescent symbols and their associated V-shaped rods, as well as a double disc with its reversed Z-shaped rod. Only the tips of the uppermost crescent and the angle of its V-rod survive. 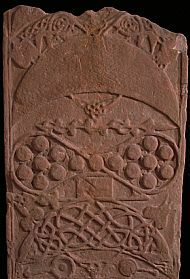 The Rosemarkie slab is the only Pictish monument that displays three versions of the same symbol. Artefacts are also depicted: the mirror and comb. Although the basic outline of the symbols was fixed the sculptor could show his ingenuity by varying their decoration. On this side of the slab the Rosemarkie sculptor again shows how aware he was of the effectiveness of contrasting textures. The open interlace of the lowest crescent is followed by the tight, knobbly spiral work of the double disc, which in turn contrasts with the flat, all-over key-pattern for the decoration of the crescent above. Trademarks of the Rosemarkie sculptor are the way that he creates ambiguities and splits linear forms so that the two strands created can add to the intricacy of his designs. The tips of the lower crescent are formed out of animal headed interlace that is used to decorate its interior. All three V-rods have their diagonals split to create knots at the apex. Animal bodies are split to vary the ornament in one of the panels on a narrow edge. The diagonal section of the Z-rod also serves to define segments of the discs. These clever idiosyncrasies show that the Rosemarkie sculptor was a master of his art. Below the symbols one would expect to find, on the grounds of the arrangements on many other slabs, a typically Pictish hunting scene. The absence of the hunt is made significant by the nature of what takes its place. Here a second cross, with equal but slender arms with stepped terminals, is set in a deep border. The background has finely meshed interlace catching the arms of the cross, but worked clear of the stud-like boss placed in each corner of the panel. To modern eyes a Pictish hunting scene is very attractive, but if one is familiar with other art of the period, the substitute, this cross, must be rated as one of the wonders of Pictish art. Its design compares directly to some of the greatest works of art of this period; the cross-pages of the illuminated Gospel-books and the cruciform, studded decoration on metalwork shrines. Neither of these forms of art has survived in Pictland but it is a justifiable inference that the Rosemarkie sculptor was deliberately copying from such a source in the presence of his community. It seems then that this particular Pictish monument was produced in a primarily ecclesiastical context and that the imagery of the hunt had no place in its function. There are six different types of cross depicted on sculpture in Groam House. Some have characteristics in common, such as hollows at the angles of the arms, which was a type of cross associated with sculpture at St. Columba’s monastery on Iona. Although none of the crosses at Rosemarkie is exactly the same, each is a recognisable type represented elsewhere in Great Britain and Ireland at this period. They belong, as a set of designs, to the common Christian heritage, of which Rosemarkie was a part. That there was such a range of types suggests that Rosemarkie’s cultural stock, comprising all the equipment necessary for the work of a church, furnishing, vessels, service books, and reliquaries, was particularly rich and varied in design. A characteristic of the Rosemarkie sculpture is the presence of recessed panels and cavities. This feature found in sculpture on Iona and elsewhere, shows us how sculpture could function. The cavities could be used to deck the monument with foliage or lights or simply have been decorated with colour or gold leaf. 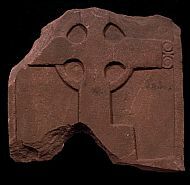 One of the Rosemarkie sculptures is carved with a ringed equal-armed cross. It has a deep cavity at the crossing, edged with a border, and similar, shallower cavities at the centre of each arm. These depressions will have held decorative glass or stone inlays and the effect would have been of a metalwork ‘jewelled’ cross. The number of monuments with recessions suggests that the Rosemarkie community held venerable relics and appreciated the use of vivid display – perhaps in the context of pilgrimage. There are many other indications that the foundation at Rosemarkie was an important one. Most of the sculpture is carved on one face only so that it could have functioned in a variety of ways. The decoration on one fragment can best be explained by its having been an altar slab. The ringed and ‘jewelled’ cross mentioned above could have been inset in an altar frontal or been placed on the wall at the back of the altar – what is known as a reredos. The long body-length slabs decorated in key-pattern, from their mint condition must have always been indoors. They could be either architectural pieces or have had a funerary function – as the sides of a composite stone tomb. Two narrow slabs, very similar in size, could have formed the narrow ends of such box-shaped monuments. Some of the sculpture has been cut back to form tenons and some is grooved. On the basis of the remaining fragments there must have been at least two composite stone monuments at Rosemarkie. 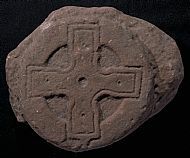 So far there is no indication of a cemetery at Rosemarkie, with graves marked with uniform cross-marked slabs or stones such as are found on some other contemporary ecclesiastical sites. Rosemarkie’s cross-bearing slabs are cut to a regular shape and often taper. 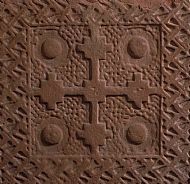 On Iona there is a similar variety of types of cross, but the slabs, for the most part, are irregular in outline. It is possible that some of the Rosemarkie slabs were the lids for box-shaped tombs, for these would have been cut to fit a regular shape. 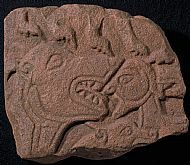 From the point of view of figurative art the surviving fragments confirm that Rosemarkie sculpture was in the mainstream. The man assailed by monstrous animals, whether representing Daniel in the den of the lions or the fate of the wicked in Hell, is typical of the imagery on slabs in Angus and Perthshire and implies pastoral responsibilities for conveying the basic message of Salvation or Damnation. Above the head of the man there are traces of an animal combat, one of the predominant themes in Pictish art. The second fragment with its procession of clerics, or possibly seculars, is equally at home in Pictish sculpture in the north and south. The fragment may be rebated, and such processions occur elsewhere on what appear to have been panels of composite monuments. The essential Pictishness of the Groam House Museum collection lies in the consistently fine standard of carving. At Rosemarkie, sculptors had the co-ordination of hand and eye that allowed their artistic inventiveness full expression but also allowed the creation of unadorned dressed surfaces that are themselves works of technical skill. 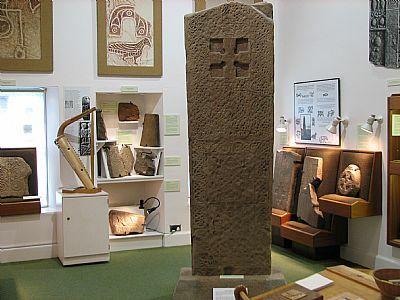 High quality carving and creativity is common to all Pictish sculpture but the particular importance of the collection in Groam House Museum is the way in which it places a symbol-bearing cross-slab of first quality in a context of the production of sculpture which functioned in other ways. Although the fabric of the early church has not yet come to light the collection affords evidence, to an unusual degree, for the life within it, its furnishings, its funerary monuments, and the contents of its treasury. To these material matters can be added the hints at pastoral care and pilgrimage, and the mystery of the grandiose display of the Pictish symbols, together giving us a tantalising glimpse of how a richly endowed church functioned in society.